The Napa Valley Wine Train, an engaging and memorable experience that echoes the glory days of train travel, is pleased to announce its new speakeasy-themed Murder Mystery Tour in partnership with The Murder Mystery Company, the largest theatrical company in the U.S. that hosts comedy murder mysteries. Launching on Saturday, April 13 and available on a select date each month through November 2019, the new Murder Mystery Tour will take passengers back in time to the 1920s to solve a murder on a three-hour journey aboard the historic train and include a multi-course gourmet dinner from Executive Chef Donald Young. Set in the U.S.’s prohibition-era, the Murder Mystery Tour’s storyline will be The Murder Mystery Company’s “Crime and Pun-ishment” experience, featuring 1920s mobsters, jealous lovers, a rival Mafioso, and a pair of undercover federal agents. Passengers will work together to solve the crime by trading clues and gathering information before time runs out and the murderer escapes. Although not required, guests are encouraged to dress in 1920s-style attire such as tassel skirts, pinstripe suits, feather boas, sequin headbands, elbow-length gloves, and fedoras. The tour’s menu, made a la minute aboard the train’s kitchen, will begin with either a salad with Skyhill Farms goat cheese, shaved fennel, radishes, toasted almonds, and champagne-dijon vinaigrette or a warm cup of soup of the day. Passengers can then choose from a variety of delicious entrées such as sliced roasted tenderloin of beef, lemon thyme roasted chicken, brown sugar-glazed pork tenderloin, kale and quinoa salad, or gemelli pasta with mushroom confit and sugar snap peas. Dessert will include a daily creation from Chef Donald Young. 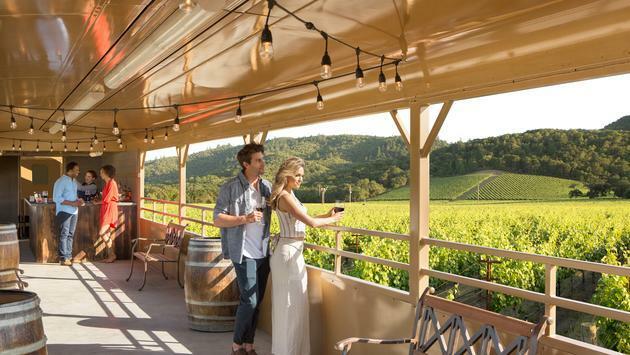 The Napa Valley Wine Train also boasts a robust menu of acclaimed wines that pair perfectly with the meal, many from the local world-famous vineyards along the train’s tracks. Check-in for the Murder Mystery Tour will begin at 5:30 p.m. and everyone is encouraged to arrive by 5:45 p.m. to enjoy the entertainment in the train station. Passengers will board at 6 p.m., depart at 6:30 p.m., and return to the station at 9:30 p.m. Tickets start at $216 per person. For reservations and more information, guests can call (800) 427-4124 or visit winetrain.com/events/murder-mystery.